LAST GAME 12/9/12: Titans 23 at Colts 27. 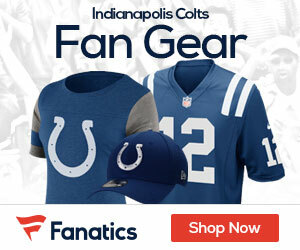 Indianapolis CB Cassius Vaughan returns INT 3 yards for TD in 3rd quarter as Colts overcome 13-point halftime deficit. LAST GAME AT SITE 10/28/12: Colts 19, Titans 13 (OT). Indianapolis rookie QB Andrew Luck leads 80-yard 4th-quarter TD drive to force OT. Colts RB Vick Ballard has game-winning 16-yard catch. BROADCAST NFLN (7:25 PM CT): Brad Nessler, Mike Mayock, Alex Flanagan (Field reporter). Westwood One: Ian Eagle, Trent Green, Rocky Boiman (Field reporter). SIRIUS: 88 (WW1) 92 (Ind. ), 86 (Ten.). XM: 88 (WW1), 225 (Ind.) 86 (Ten.). COLTS: Have won 3 of past 4 at Ten…Have 3-1 road record this season…QB ANDREW LUCK is 6-2 with 13 TDs vs. 6 INTs & 83.3 rating vs. AFC South. Luck (10) has most game-winning drives by QB in 4th qtr./OT in 1st 2 seasons of career since ’70. Since 2012, has 8 rush TDs, most by AFC QB. Had 3 TDs vs. 0 INTs & 92.8 rating in last road game. Registered 8th career game with 300+ passing yards last week…Since ’12, RB TRENT RICHARDSON has 13 rush TDs, 3rd-most in AFC. RB DONALD BROWN is averaging 120.5 rush yards per game in past 2 vs. Ten…WR T.Y. HILTON has 7 catches & 100+ rec. yards (121, 130) in each of past 2. Has 4 100-yard rec. games in ’13…LB ROBERT MATHIS has career-best 13.5 sacks in ’13. Posted 5th game of season w/ at least 2 sacks last week…LB JERRELL FREEMAN leads team w/ 75 tackles…TITANS: QB RYAN FITZPATRICK completed 22 of 33 passes (66.7 pct.) for 264 yards with 2 TDs vs. 0 INTs & 111.2 rating last week. In last start at home vs. Colts (w/ Buf. on 1/3/10), Fitzpatrick had 3 TDs vs. 0 INTs & 120.8 rating…RB CHRIS JOHNSON has 2 career games with 100+ rush yards vs. Ind. (113, 111). Titans are 25-9 (.735) when Johnson has 100+ rush yards. Has 6 career rush TDs of 80+ yards, most in NFL history. For career, Johnson avg. 104.9 rush yards per game in Nov. RB SHONN GREENE rushed for 161 yards in last game vs. Colts (w/ NYJ. on 10/14/12)…WR KENDALL WRIGHT has team-best 292 yards after catch in 2013. Wright (580) needs 47 rec. yards to surpass career-high…TE DELANIE WALKER has career-best 4 TD rec. in 2013…DT JURRELL CASEY has career-best 7 sacks this season…CB ALTERRAUN VERNER has career-high 5 INTs in ’13.